Glad to say we received some much needed rain night before last and yesterday morning. 50/50 chance for some more on Saturday. Otherwise, clear and nice temperatures once we get into the weekend and early part of next week. Upper 70s to low 80s. Sweet! Not much change in the generation schedule. Still off in the a.m. and cranking by noon or 1:00 p.m. Today was a little different. They ran a low one unit for about four hours this morning, then turned it off and it is scheduled to come back on at 1:00 p.m.
Not too busy this past week. Probably just as well as fishing has been up and down. Stan out Wednesday with Lester and Mike from Texas. Best part of that trip was a 17 inch rainbow. No good pattern. Saturday, Stan had a couple guys from Illinois on the water. Good day for them on the size 18 root beer, P&P and rusty midges. Pretty rainy, foggy day. As a matter of fact, I think the sky opened near the end of the trip and dumped rain on them as they were trying to get off the river. Fred and his son, Troy, spent Sunday morning on the water with Stan. Pretty slow day, but they did catch several fish on the P&P. 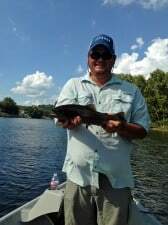 Monday, James Albert spent a great day with Darrell which included a brown and a nice 17 inch rainbow. Best patterns were the white grub, egg and gray scud. This entry was posted on Wednesday, September 3rd, 2014 at 12:52 pm	and is filed under Fishing Reports. You can follow any responses to this entry through the RSS 2.0 feed. You can leave a response, or trackback from your own site.